Saluting Magpies: Rambling TMI chat & a recipe! This week I was ill. From feeling drained & a bit ‘off’ on Tuesday evening to sickness & diarrhea (I did say there would be too much information!) on Wednesday, with me splitting my time between the bathroom & my bed trying to recuperate. I felt totally wiped out & spent a huge chunk of the day sleeping. This morning I felt better, still had stomach ache but questioned whether that was because I was still ill or because I hadn’t eaten since breakfast yesterday (and I saw that again within a couple hours! More TMI! Sorry!) I had that ‘morning after the sickness before’ quandary – should I have breakfast or will it make me sick again? I decided to go on the side of caution & leave it a couple hours to see how I felt. I walked the dog, the fresh air certainly made me feel clearer headed & dare I say it; hungry. I decided that what I needed was something quick & easy, that would provide plenty of nutrients that my body was short on after yesterday, was easy to eat but still tasted yummy. What ticks all those boxes for me is a smoothie, specifically an Oatmeal Almond Milk Smoothie. Yum. So I thought I would share my recipe. I use US measuring cups to get the quantities but I know not everyone has measuring cups so I’ll post it twice – one with cups, one with grams & milliliters. 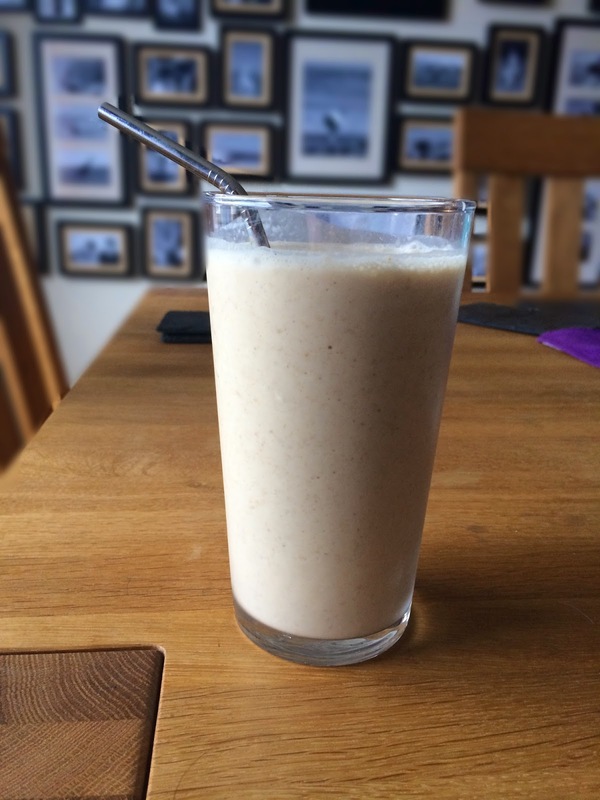 A yummy, easy breakfast that can be enjoyed any morning, not just when you’ve been ill!